This website uses census data, photos, and maps to reconstruct the history of every historic structure in the Truxton Circle neighborhood of Washington, DC. Users browse the site by square. The project includes a brochure meant to help users navigate the site. The Humanities Council reserves the right to display and distribute grant funded projects for educational purposes. 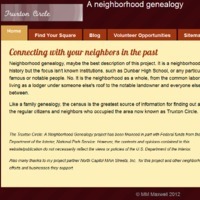 Maxwell, MM, “Truxton Circle - A Neighborhood Genealogy,” DC Digital Museum, accessed April 22, 2019, https://wdchumanities.org/dcdm/items/show/1581.